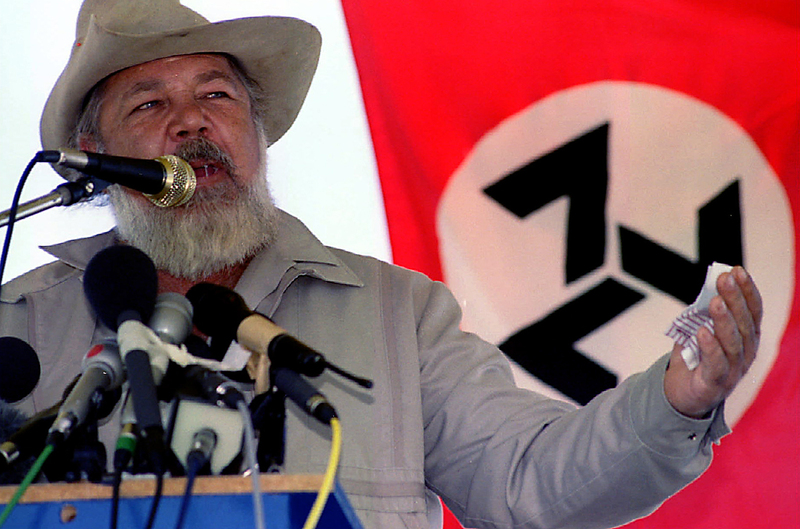 Late on Saturday night, former Afrikaner Weerstandsbeweging (AWB) leader Eugene Terre'Blanche was murdered on his farm near Ventersdorp, apparently over a pay dispute. But while this would, on a normal South African day, simply be one of many gruesome murders that we've all become pretty much used to, this one threatens to be very, very different. As we write this, South Africa is waking up on this Easter morning to face its deepest fears. Terre’Blanche’s murder, reprehensible and horrible as a single act could be, may also provide the fuel for the long-simmering racial hatred to finally burst into the open and take over our reality. It would almost be laughable, if it wasn’t so tragic, that as of today in South Africa, every white person is seen as a supremacist and every black person as possible murderer. How did we come to this? And what can we do to reverse the tide? In times like these, the facts on the ground do not matter so much anymore. They are usually slotted as bullet points into flaming rhetoric by the populist leaders who thrive in times of chaos and mayhem. There are certain necessary ingredients, say, a country populated by many nations, religions or races; maybe all of the above. The country’s economy is not doing very well, people are struggling. Make no mistake, it is never more than a sliver of them who really want to fight the civil war. The tiniest, most miniscule bunch, maybe a couple of thousands of madmen possessed by rage and guided by fanaticism. Many of them believe they have no other choice than to destroy the current system, or face jail for crimes and misdeeds they committed in the past. But they are usually well-positioned: They are in the army, police, state-owned businesses and they have many friends in the media. And access to money. Every civil war is preceded by the populist leaders’ concentrated campaign of incitement and hatred. The messages may differ, from blaming other nations, religions, or races, but they all have the very same message: It is the other side’s fault that we suffer, they hate us and plot our destruction; we need to strike first. And when the real sparks start flying, no matter how small they may be, they are fanned by the wave of the complicit media’s exaggeration. In the process, the extremists are painted as the real representatives of the majority and the only choice available. The breaking point happens when the normal, law-abiding citizen, who’d rather be raising a family in peace and prosperity, is faced with no choice but joining one side in the conflict. The polarisation of the country is almost immediate: It sometimes happens literally overnight. This reporter saw the madness developing firsthand in Yugoslavia in late 1980s and early 1990s. Good news is, South Africa is not there yet, not by a country mile. Bad news is, South Africa will get there eventually, unless something is done, decisively and emphatically. The ANC must become the party of governing, again. Ever since the Mbeki-Zuma feud consumed the party, it’s been rendered virtually impotent by the internal battles, about who’s going to be the boss. The hopes that the Polokwane conference would finally allow the Zuma people to start doing what they’ve promised to do, lead a government that will deliver, were dashed in the years that saw a loud ascent to power of one Julius Malema, who almost single-handedly turned the tripartite alliance (ANC, Cosatu and SACP) into the chaos of warring factions we see today. While they were fighting, the country’s infrastructure was allowed to crumble and corruption become a fact of daily life. And in the aftermath of Terre’Blanche’s murder, the ANC is allowing itself to be painted into a corner again, where the welcoming hands of Malema and the “Kill the Boer” debate was waiting. It is time for the ANC to start serving the country and not the narrow interests of few people inside its leadership. Although it is politically very tempting for the opposition to take a swipe at Malema every time somebody gets killed, there’s no proof that he could be in any way responsible; not yet, at least. Terre’Blanche’s murder is a terrible, tragic act that’s been repeated many times in this country as it is and there’s no need to add fuel to the fire. The opposition should rather spend their energies helping people of South Africa understand that extremism is not the only choice. White people should understand that their black friends are not going to kill them tomorrow because two frustrated, drunken youths killed Terre’Blanche somewhere in North West. Black people should understand their white friends will not form the Ku Klux Klan just because a couple of hotheads are threatening revenge. And the media, WAKE UP! We must not forget how we arrived here! Dial the clock back a couple of weeks and you’ll remember that the main topic was Malema’s millions. Where are those stories now? In one fell swoop, Malema took entire SA media by the leash and lead us over the water, away from the space he couldn’t win to the space he can’t lose. We, as the collective, need to start thinking clearly. Now. And need we remind ourselves that there’s a certain sport event happening in this country in just over two months’ time? The dark forces want us to present to the world a picture of us that will haunt us for many years to come. Are we going to allow that to happen? President Zuma, it is time for you to lead this country.